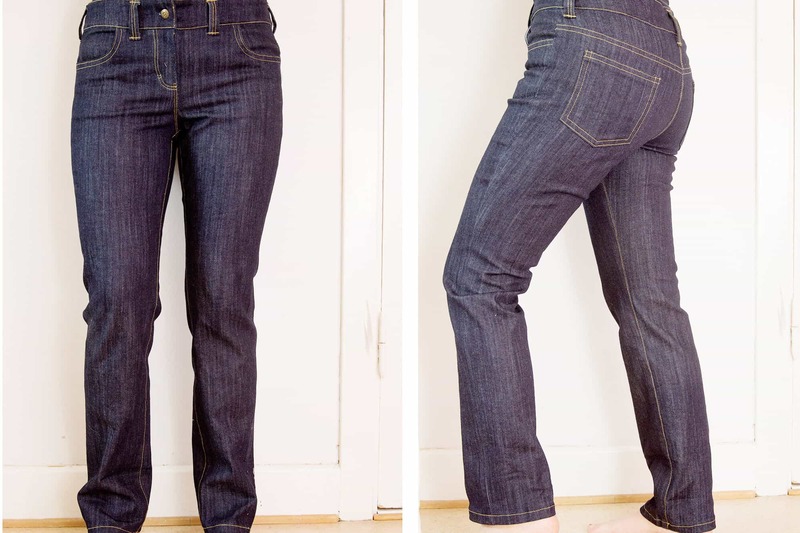 I’m very particular about my denims, and trying out RTW jeans is a very defeating experience for me (too tight around the tummy and thighs, saggy in the bum and always way too long). So apart from a pair of Lee jeans that I bought in a charity shop, I’ve only been wearing me-made jeans the last seven–eight years. My favorite pattern is Anita from Burdastyle (but go down one size for a skinny fit and the legs are long!) and I’ve tweaked the fit a little bit, so that they are exactly how I want my jeans (straight legs and fitted). The fabric is from the designer jeans company G-Star Raw, I bought in Denmark because finding good denim in Sweden is pretty much impossible. Even though we have big two jeans companies here, Nudie and Cheap Monday. But apparently Swedish design companies don’t resell fabric that has been left over from production. Instead it stays in China or wherever else the jeans are made. A previous pair of the Anita Jeans, also made with denim from G-star. That said, I did recently bought the Ginger Jeans from Closes Case Patterns, because I was curious about this wildly popular pattern, so maybe some day I will try that pattern too! Have you tried the Ginger and what did you think ? You should be able to source good quality denim online from japan. I find it on etsy or sometimes find denim locally at a few stores. Selfedge denim is very popular, denim where the bound edge serves as the side seam on your jeans. This requires a special pattern where the seam on the side is straight. As far as patterns, big message – stick with a pattern that works for you. Having sampled many patterns, the best fitting I have found is burdastyle. What I ended up doing was a rub off of an existing pair of rtw jeans to give me the precise fit that I like. I also made sure the details were correct, the rise, the size of the back pockets and deep pocket bags ( short pocket bags and pocket opening that can fit my hand). Further, you need to be flexible especially if you loose weight or gain weight. For ginger jeans, if you combine the skinny version with the regular version (ie mid rise from the regular version and the skinny leg from the high rise jeans version) you will get a fit close to rtw. Beside high waist pants always look weird to me. Oh denim from Japan, that would be a dream, that selvedge is gorgeous, but that would call for fairy wide legged trousers to show it off. I agree that Burdastyle has tremendous draft for their trousers and very consistent. And I did get the mid-waist version of ginger, I feel like that high waist cuts off my short body in a weird place. Cool that you got the Wendy book, I think the draft and pattern pieces are very good, very RTW in styling and details. But I totally feel you about finding a pattern that works and not want to go through the same process again. I’m the same!